UPDATED: Sun., July 29, 2018, 8:59 p.m.
REDDING, Calif. – The deadly Northern California wildfire that has forced tens of thousands of people to flee their homes slowed down Sunday after days of explosive growth, giving officials hope even as they announced the discovery of a sixth fatality. In Redding, officials struck a hopeful tone for the first time in days. “We’re feeling a lot more optimistic today as we’re starting to gain some ground rather than being in a defensive mode on this fire all the time,” said Bret Gouvea, the California Department of Forestry and Fire Protection’s incident commander on the blaze around Redding, a city about 230 miles north of San Francisco. The so-called Carr Fire that affected Redding – a city of about 92,000 people – was ignited by a vehicle problem on Monday about 10 miles west of the city. On Thursday, it swept through the historic Gold Rush town of Shasta and nearby Keswick fueled by gusty winds and dry vegetation. It then jumped the Sacramento River and took out subdivisions on the western edge of Redding. The latest tally showed at least 517 structures destroyed and another 135 damaged, with the fire having consumed 139 square miles. A count by the Associated Press found at least 300 of those structures were homes. Some of the 38,000 people forced to evacuate said they were frustrated because they didn’t know whether their homes were standing or destroyed. 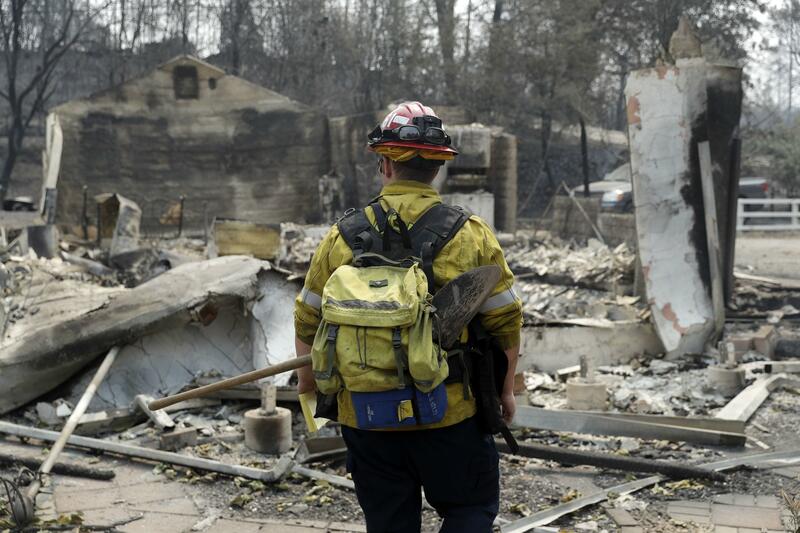 Authorities had not reopened any evacuated neighborhoods where fires raged due to safety and ongoing investigations and urged people to be patient, saying they would soon let residents back. Fed up, on Sunday morning Tim Bollman hiked 4 miles on trails up steep terrain to check on the Redding home he built for his wife and two sons 13 years ago. He found rubble. “It’s the craziest frickin’ thing you have ever seen,” he said, his eyes filled with tears. But then he composed himself. “It is what it is,” he sighed, and then hiked off. The firefighters killed in the blaze included Don Ray Smith, 81, of Pollock Pines, a bulldozer operator who was helping clear vegetation in the path of the wildfire. Redding Fire Inspector Jeremy Stoke also was killed, but details of his death were not released. About 100 miles southwest of Redding, one of two blazes that started in Mendocino County forced the evacuation of Lakeport, a city of about 5,000 people, after destroying four homes. More than 4,500 buildings were under threat, officials said. The two fires had blackened 39 square miles and were each 5 percent contained. Some evacuations were lifted but officials said Yosemite Valley, the heart of tourism in the park, will remain closed until Friday. A big fire continued to burn in the San Jacinto Mountains east of Los Angeles near Palm Springs, but officials lifted evacuation orders for several communities after reporting significant progress by firefighters. The Yosemite and Southern California blazes had burned nearly 100 square miles. Published: July 29, 2018, 3:15 p.m. Updated: July 29, 2018, 8:59 p.m.